But today it is well-known in whole Germany. And also far beyond the borders. Even in the Brazilian news you could watch the Nazi demonstrations, as well as the Hilter salute of an early-retired man in Freital. Pegida, Legida and Co. are probably no unknowns in the international reporting. Sad, but bitter reality. Not just since yesterday, the neo-Nazi wave has run over the “flourishing landscapes”, as Helmut Kohl once called the new eastern states of Germany. Because if you believe the reports, especially those states are influenced by excessive national pride and a cowardly xenophobia. The first outcry probably occurred when the NPD moved into the Saxon state parliament. Many things happened since that day. Nazi marches were prohibited, counter-demonstrators were held and processes against Nazi functionaries were made public. All those things weren’t enough. Because refugee shelters still go up in flames and on facebook you can read mockery and malice against foreign cultures. Social media offer a perfect space to give free rein to your rage anonymously. But who believes in emerging unscathed is totally wrong. Even slander, libel and sedition in social networks can form the basis for a criminal complaint. Most Nazis don’t think so far. Or they simply don’t care. The main point is that they state their opinion and then they justify it with: “I am not a Nazi, but …” Anyone who starts a sentence like this, knows exactly that nationalistic ideas lie dormant within him. But who are these people who project their hatred on others? I myself – more or less – come from a so-called focal point, generalized from Saxony-Anhalt. in the following, I will dig in my experience once. There are those neo-Nazis, who are easily frustrated by their lives, because for example they can’t find a job for years or are a single parent of three children alone and are supported by the public purse. Of course, such a life can be very sobering, especially when you are afraid for your basic security. But neither pensions nor the child benefit nor the Hartz IV will probably be reduced in the near future. Because the expenses for refugees and asylum seekers come from a totally different pot of money than the social spending. When talking about money, there is always the argument that refugees don’t work. And yes, that they aren’t even allowed to do so. Finally, they don’t have a work permit. In some cases, it will take several years to get one, depending on the asylum application which must be approved in advance. The financially weak neo-Nazis are joined by those who are afraid of Islamization or the alienation of the German culture. The fear of losing your own cultural identity forces them to judge others polemically and maliciously. But what actually can be called German culture? Aren’t we even made of various Germanic tribes, combined with a touch of Roman conquest and Slavic migration? And even if you insist on this cultural aspect, then I wonder why cultural diversity could be so wrong. Insofar you preserve what you see as German, you shouldn’t have to worry. I would like to hear a fully recited Goethe poem by every self-proclaimed cultural romantic or to know how many German novels he has read in the past year. However, the tip of the (nationalistic) iceberg is celebrated with an image on facebook which shows a blond – as a symbol of German – child in the midst of veiled women, subtitled with: “Where did you come from”. Other propagandistic images are those of refugees with smart phones in their hands. While it can’t be imagined by some neo-Nazis, but also in those countries, there is access to electricity, internet and new technologies. And these phones are often the only way to get in touch with loved ones abroad. It is also true that many of these refugees are young men. But this argument is quickly disarmed. For days on a crowded boat, without any hope to immigrate, without food and without water, most of them die. Who would send his children, his wife on such a journey? And so it is probably the lesser of two evils to stay in a shelter in a dangerous country than to go on such a fatal trip. Whoever says something different has never seen such a refugee boat in real life, far less emphasize with a refuges. 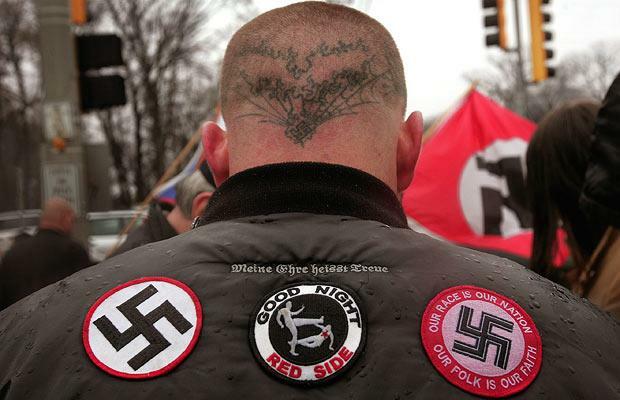 The final category of Neo-Nazis are the functionaries who rally all followers. They are so rhetorically so fit that they can influence easily gullible people, outcasts and cultural fascists. And these are also such people who could impress the masses before 1933 with simple slogans, who could cloud the German mind. But during my research I figured out – with great pleasure – that their grammar and spelling were settled at a higher level 80 years ago – and are probably more and more adapted to the popular social media slang. Fromward the German language and towards an internationalization. What sense of irony – written by life. And then I am even a little less ashamed of living here.